Like a cockroach, DASH is fast and robust. Have you ever tried to catch a running cockroach? They’re fast little suckers, and resilient too, which is why scientists at the University of California Berkeley modeled their latest robot after them. DASH or Dynamic Autonomous Sprawled Hexapod is a six legged robot made from cardboard and polymer. It’s the size of your open hand, weighs just 16 grams, can run up to 1.5 m/s, and survives falls of 28 meters without damage! This cockroach bot is really something to behold. Check out the IEEE Spectrum video after the break and watch how DASH survives the fall from the top of a building and keeps running. As robotic systems become increasingly complex, they are able to mimic real world creatures. There are toys like the hexbugs, and more advanced robots like StickyBot that exhibit animal skills and/or behavior. The reverse is also true, we’ve seen robotics used to help explain developments in evolution. This interplay between the sciences is important stuff. When the advances in one field are applied in another the rate of new discoveries increases. Feedback loops between biology and robots may be one of the means by which we develop the next generation of genetically engineered machines and life-like automatons. Watching DASH in action, I’m stunned by how simple yet powerful the robot is. The oar-like motion of its legs is rudimentary, but it allows the bot to travel at 15 body lengths per second. Humans would have to run at 65 mph (~100km/h) to match this feat and we have much more complicated gaits. I’m equally impressed by the upwards scramble at 1:56. Can you imagine running at a 6 foot wall and just popping over it? UC Berkeley’s Biomimetics Lab, where DASH was created, is also interested in the way that robots are built. To that end, DASH has one of the coolest constructions I’ve seen in a robot that performs this well. First, the materials used for the chassis are simple: cardboard and polymer. Just one DC motor for forward motion and a smaller servomotor for turns keeps the bot weight down (16.2 grams is next to nothing!). Second, the build time (less than one hour) is ridiculous for a hand made robot. Considering DASH’s simple construction, I wonder if they’d be willing to design a version that could be made on a 3D printer like MakerBot. Finally, the design is absurdly robust. I’ve seen some robots that you can toss around, and robots that can jump a wall, but none that can free fall for 25+ meters onto concrete and then walk away. As cool as DASH is, I’m not sure that we’ll see much more of it. Upgrading to using a carbon fiber body would make it more resilient, but I don’t know that we need a resilient cockroach bot. Instead, I think that DASH is going to be an inspiration piece. It’s a robot whose design, construction, and performance will help engineers create the next generation of industrial and research machines. 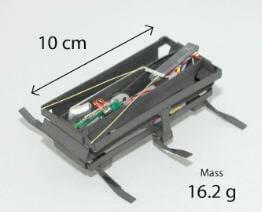 We could see smaller versions become part of a robotic swarm, or larger versions act as hazardous environment probes. As engineers continue to adapt animals into robots, there are all sorts of amazing possibilities. DASH runs as fast as a roach, I wonder if there will be a bot that jumps as high as a flea, or that has the proportionate strength of an ant. Certainly we could use a beetle robot to deal with all the… dung… going on in our world.